We have all played sports at some time in our lives. Most of us, however, have never dunked a basketball, hit a 90 mph fastball or shot a round of golf under par. We simply can’t relate to the lives of professional athletes. For the longest time, Phil Mickelson was branded the world’s second greatest golfer. As with most golfers on tour, Phil lived in Tiger’s shadow. For Phil, however, that shadow loomed considerably larger. As Tiger’s most bitter rival, Mickelson always seemed to come in second, never able to get over that hump. He was routinely criticized for folding when it mattered most. In 2004, Phil finally removed the ‘greatest golfer to never win a major’ label, winning his first Masters in spectacular fashion. These days, winning at Augusta National must seem routine for Phil as this Sunday, he tallied his third win at golf’s most prestigious tour stop. For those of you who failed to tune in last weekend, Mickelson was dominant. On Saturday, he became only the third golfer ever to ever shoot back-to-back eagles at Augusta. Then came Sunday’s shot on the 13th hole that will go down in Masters lore: a 6-iron that soared 207 yards between two pine trees and landed four feet from the hole. Mickelson shot a bogey free Sunday, finishing 16-under-par for the tournament, capturing his fourth major and winning $1,350,000 in the process. Winning the Masters, heck, even PLAYING at Augusta is something few of us can imagine but on a more personal level, Phil has had family issues which remind us that professional athletes are still human. That’s what made Sunday so memorable. Last May, Phil’s wife was diagnosed with breast cancer. Weeks later, his mother was similarly diagnosed. Shortly thereafter, Mickelson took time off from ‘work’ to spend time with his family. His eventual return to golf was considerably less celebrated than another golfer who recently experienced a more publicized absence. As Mickelson walked off the 18th green at Augusta this Sunday, he had one important pit stop to make before being fitted with his third green blazer. His wife and children were waiting in the audience. They hugged and wept, knowing that although her disease is incurable, if only for a moment, all was better. They celebrated as a family, something it will likely take Tiger Woods much longer to do, if it ever happens for him again. For anyone watching on Sunday who has ever lost a loved one, a mother, a grandmother or a friend to cancer, Mickelson’s performance graced us with a moment of reflection. Do professional sports feature their share of dunces? Absolutely. What walk of life doesn’t? But every once in a while, we are treated to a magical event, such as last Sunday at Augusta. These are the moments not even the greatest authors or filmmakers can recreate. This is why even the casual fan can tune in to a sporting event such as this and witness real-life, unscripted drama. These are real life stories. These are the reasons we watch sports. And that is why I am a sports fan. This entry was posted in Tee Box and tagged Augusta National, Masters, PGA, Phil Mickelson, Tiger Woods by Chris Humpherys. Bookmark the permalink. Glad he won…Just hope Tiger pulls himself together. There’s still a lot of Tiger fans out there, Kay. Maybe that’s surprising, maybe not. But there’s no doubt that for whatever reason, Tiger still has that ‘it’ factor about him. When he’s on the course, people watch. When he’s not, people don’t. It’s a simple as that. Sometimes karma can be a b_tch and other times she can be sweet. Congratulations Lefty and may God bless. Aer… you got that right. It’s one of the main reasons we watch sport not just because of the mental , physical or competitive aspect of it all. It also comes with emotive charge of the plot lines that tend to go with it. Some were there merely to see the ” train wreck” that is now Tiger Woods . Others once they saw that Phil was in with a chance of winning it all , wanted to see “him” do just that ! And myself also was included among the throng hoping that “Lefty” would pull off the win ! Nice to see someone else get a little attention. His performance was definitely worthy. Thanks for another most excellent post. Midway through the third round when he went double eagle , double eagle , birdie . Well, that essentially sewed up the tournament for him. Tiger wasn’t at all there mentally despite how he played. That is the difference ‘tween him playing really well and plain average by his own standards. Lucy Beckers say she’s willing to bare your children . Are you up to the task ? See my latest piece and let me know what you think ? All of us at some point or another think that we’re prognosticators ? I try to be at times but essentially I’m just a wholehearted sports fan. All I ask of the team I support “is that they give it their best shot” ! Let me know what you think of the following ? I don’t follow much golf but I paid attention to Phil ever since I read that he invited his wife’s oncologist to be his guest at the last tournament in which he competed. He wasn’t in the running to win so he asked his caddy if it’d be OK if the oncologist served as his caddy for a hole. Well, he did well and the oncologist was his caddy for a few more holes. It was a small gesture but I’m sure it was a thrill for the oncologist (even if Phil might have bent a few PGA rules.) For anyone who has ever had to deal with cancer, you know how vital a role the oncologist plays. He is the most important person in the health care team. I truly believe in karma. 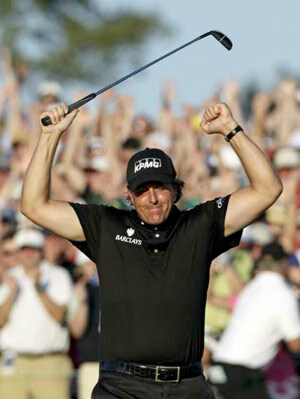 Phil was given the thrill of his life in winning the Masters. Bravo!! If you’re Brandon Marshall right ’bout now you must’ve felt that you’d hit the Lotto jackpot . died and gone to heaven. He gets traded from the Broncos to the Dolphins and in the meantime they offer him a contract extension of 4 yrs $47 million with $29 million guaranteed in the first three years . All kidding asides this has nightmare written all over it ! Bill Parcells, who knows a thing or two about talented, temperamental receivers, decided Brandon Marshall is worth the trouble for the Miami Dolphins. Parcells also decided Marshall is worth two second-round draft picks — and a contract extension that makes him one of the NFL’s best-paid pass catchers. I wonder what happened to Parcells this morning after he got up out of bed ? M… the post was out of respect for Nat and Gram. It was all I could think about this weekend while watching the end of that tournament. As usual, I’m behind on my reading. But duty calls. It’s nice to see Phil play headstrong. It’ll be interesting to see how long it takes Tiger to win his next major with Phil playing like he is. I have NO idea who will win this year’s Finals. But I am liking me some Orlando. Then why do I never win at golf? That’s a fantastic story. I had not heard that about the oncologist. I’m glad you liked the piece. Like I said in the post. Those who tuned in to the Masters on Sunday were treated to a special event that all made us grateful for what we have. Once again, Al, we’re treated to a player getting paid for what he can do ON the field. And there’s no denying Marshall was probably the most productive WR in the league last year. I have enough faith in Parcells to keep him in line. After all, he has Jerry Jones’ drunken blessing, does he not? Brandon Marshall much like Ben is more of a danger to others and himself . Seven separate incidents of spousal abuse against different females . But four of the most recent are with his current girlfriend. Not only that but the incident that led to the death of Broncos’ teammate Darrent Williams was instigated by Marshall who’d gotten into a prior altercation with the assailants. Williams caught the back end of that bi_ch unfortunately ! Prior to KP initiating his piece on the woefully inept Orioles . I was in the midst of doing this piece. Phew Who Didn’t See This Coming ? As and when you’re ready . Well, Al, now he’s Miami’s problem and speaking from experience, one can get into a lot more trouble in South Beach than one can in Denver. True, however, bourbon, like putters, is an integral part of my game. And a part of any nutritious breakfast. Enjoyed the read… love the story with Phil and have always been a fan of his… the Masters was terrific this year and to be honest, this was the best performance I have ever seen by Phil in a major… he was phenomenal over the weekend and with everything he has had to deal with at home… man, that’s impressive stuff. It was a great tourney and a solid performance by Phil, KP. It’s funny how the media always tried to develop this rivalry between Tiger and Phil by almost painting Phil as the unlikeable one over the years. Guess that’s changed a little, huh?